"We knew that if we were going to open another salon it had to be something completely different," Gibson said. He and Jason Backe, his husband and business partner, had previously run East Coast salons, but closed their New York space at the end of 2016 because of changes in the market. Starring will be the "world's first smart salon," Backe said. "Everything from the access to the front door, the music, the lighting, the coffee maker, the Roomba, the HVAC — everything is smart capable." Starring will feature five hair stations, called "clouds," which are each equipped with an Amazon Echo voice device and a tablet for clients to stream Netflix or online shop. Stylists will curate their own Amazon storefronts with their product picks, which clients can potentially shop from the chair — with stylists receiving a commission from purchases, Gibson said. Each cloud has different white lighting options, so clients can see how their hair color will look in different types of light, as well as colored lights meant to be used for chair-based Instagram moments. The walls of each space are outfitted with LED light strips that run up and around the edges of the space, creating a light box effect. "The whole idea is…a first-class luxury experience," Gibson said. "You're in your own pod, if you will, and it's the same kind of idea where you have a customized experience from lighting to shopping to entertainment. Anything you don't get at a traditional salon." That includes the shopping experience. Beyond curated Amazon shops, clients or passersby at Starring will be able to shop via QR codes, which are located on large light boxes on the front and back of the salon. Each will have a product QR code, which people can scan to buy Gibson's products on Amazon, where he exclusively launched the line in 2018. The idea is to eliminate the $15,000 to $20,000 worth of inventory that a hair salon normally carries, Backe said. "You're waiting for someone to sell it who doesn't want to sell it — the hairdresser — and waiting for someone to buy it who doesn't want to buy like that anymore," he said. The Amazon pages that stylists create will likely span beyond just Gibson's namesake line, to hair tools and other hair products. "What you do is put together your own shopping site for yourself as a hairdresser, you put the products you believe in — tools, blow dryers, anything — on your site, and while the guest is in the chair you can say, 'this is what I recommend.' She can buy it from there, it'll be there in two days with Prime and then the hairdresser gets a cut of it." "What has done with that is they really have taken this idea of the power of the influencer and they're allowing for the creative opportunity for individuals to be influencers in their direct community," Gibson continued. In addition to Amazon, between 15 and 20 hair salons are carrying Gibson's product line, which for now, consists of Shooting Star Texture Meringue, $52. Four more products — a shampoo, conditioner, hairspray and mist called Beautifulist — are in the pipeline, Gibson said, as is additional distribution through Violet Grey and potentially other retailers. 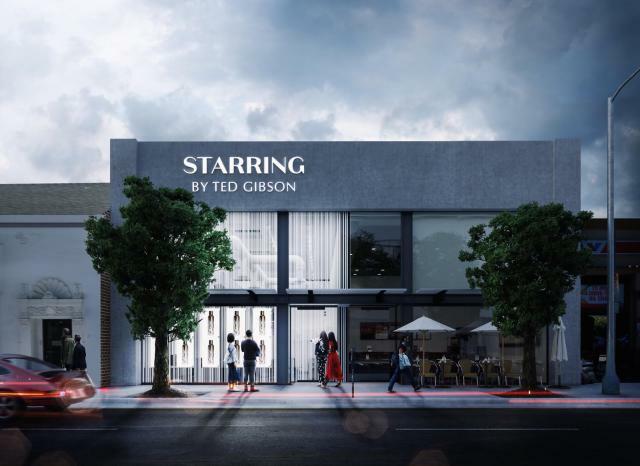 Gibson is also toying with the idea of taking the Starring salon concept into more U.S. cities, he said. Industry sources estimated that project could reap between $4 million and $5 million annually.